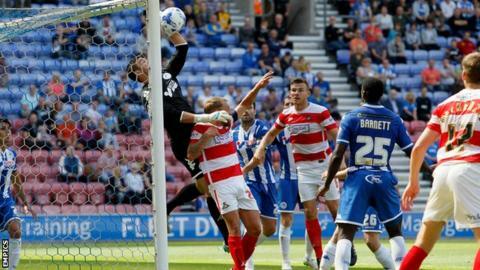 Wigan secured their first point since relegation to League One with a goalless draw at home to Doncaster. Harry Forrester almost put Rovers ahead after just two minutes but his shot from Andy Williams' lay-off snuck wide. The hosts went close when Michael Jacobs' free-kick flicked the bar, before Latics keeper Richard O'Donnell denied Williams and Forrester. Wigan midfielder David Perkins then cleared a header from Gary MacKenzie off his line as it ended 0-0. Match ends, Wigan Athletic 0, Doncaster Rovers 0. Second Half ends, Wigan Athletic 0, Doncaster Rovers 0. William Grigg (Wigan Athletic) wins a free kick on the right wing. Craig Morgan (Wigan Athletic) is shown the yellow card for a bad foul. Attempt missed. Harry Forrester (Doncaster Rovers) right footed shot from the left side of the box is close, but misses to the left. Corner, Doncaster Rovers. Conceded by Jonjoe Kenny. Corner, Doncaster Rovers. Conceded by Leon Barnett. Leon Barnett (Wigan Athletic) wins a free kick on the right wing. Harry Middleton (Doncaster Rovers) wins a free kick in the attacking half. Foul by Sean Murray (Wigan Athletic). Attempt missed. Andy Williams (Doncaster Rovers) right footed shot from very close range is too high. Attempt saved. Max Power (Wigan Athletic) left footed shot from outside the box is saved in the bottom right corner. Foul by Gary Mackenzie (Doncaster Rovers). Shaquile Coulthirst (Wigan Athletic) wins a free kick in the defensive half. Foul by Jonjoe Kenny (Wigan Athletic). Attempt missed. Sean Murray (Wigan Athletic) right footed shot from outside the box is close, but misses to the left. Gary Mackenzie (Doncaster Rovers) wins a free kick in the defensive half. Attempt missed. Michael Jacobs (Wigan Athletic) left footed shot from outside the box misses to the right.